Italy is a country where sport is very important to the locals and this is certainly true in Florence. Football is one of the biggest spectator sports here, with the Stadio Artemio Franchi being an enormous soccer stadium dating back to 1931 and capable of accommodating just under 50,000 seated spectators. Located on the north-eastern side of Florence, in the direction of Poggio Gherardo, the Stadio Artemio Franchi has played host to a number of important championship football matches over the years, including the FIFA World Cup in 1990. The stadium is also occasionally used to stage major concerts, with past artists including the likes of David Bowie, Madonna and Bruce Springsteen. Each year at the end of November, the Florence Marathon (Maratona di Firenze) is a major local sporting event and was first held in 1984. Today, this is the second-largest marathon in Italy, attracting roughly 10,000 runners and many more spectators. The course takes in many of the city's finest architectural gems, such as the Piazza della Signoria and the Basilica of Santa Croce, starting in the Lungarno Pecori Giraldi area and finishing at the Piazza Santa Croce. Football is a real passion amongst the Italians and Florence is no exception. The local football team is the Serie A Fiorentina, who are one of the top teams in Italy's premier league. Games are played on alternate Sundays from August to May at the Artemio Franchi Stadium, on Viale Manfredo Fanti. Based at the Stadio 'Due Stade' on Via Ximenez, Rondinella Impruneta serves as Florence's second team. Tickets for matches can be purchased at the Toto booth on the Piazza della Reppubblica. 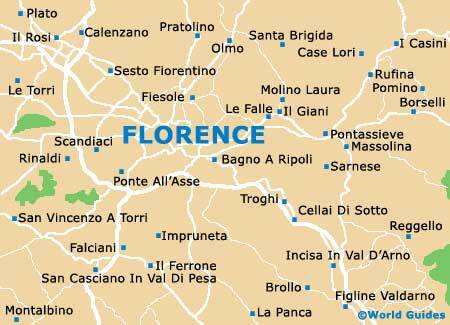 On the June 24th, Florentines celebrate their patron saint with an historic football match. 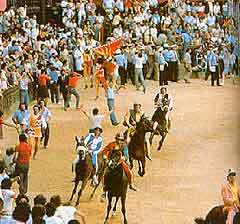 Players dress in medieval costumes and the celebrations usually carry on well into the evening. The northern Italians love the sport of cycling and there are many races throughout the year. For more information on current cycling events, the best place to look is in the sports pages of local papers. Alternatively, if you wish to cycle yourself, there are many bicycle rental shops in and around Florence and this provides a great way to travel around both the city and the surrounding Tuscan countryside. There are two main golf courses near to Florence, offering a good game with some splendid views. The Golf Club Montelupo at Fattoria di Fibbiana, Via Le Piagge, has a course of nine holes and is situated on the banks of the River Arno, 26 km / 16 miles from the city centre. The Golf Club Ugolino on Via Chiantigiana resides within an olive grove, roughly 10 km / 6 miles from Florence. It has 18 holes and is usually only open for the winter season. There are several well-equipped fitness centres in Florence, with weight training facilities, frequent exercise classes, personal trainers and more. The Indoor Club on Via Bardazzi is an established club with daily opening hours. Virtually the entire Tuscan coastline has sea-bathing facilities of varying quality. The most developed area lies between the Marina di Pisa and Marina di Carrara. Florence has several open-air swimming pools that are open from June to September and the most popular can be found in Cascine Park - named the Piscina le Pavoniere. Public tennis courts are situated at the Circolo Carraia on Via Monte alle Croci, where they are open from 08:00 to 23:00. There are also other courts available at Circolo di Tennis on both Via di Scandicci Alto and Via della Robbia. For rowing on the River Arno in Florence, contact the Canottieri Firenze Comunali at Lungarno Ferrucci, or the more upmarket Societa Canottieri Firenze, who have a delightful clubhouse and landing stage near the Ponte Vecchio at Lungarno de'AML Medici. The rivers in Tuscany are clean and offer lively sport to anglers. There are also countless small lakes and rivers that are well stocked with fish. An annual permit is very cheap and can be easily obtained from the offices of the Federazione Italiana della Pesca Sportiva. Tuscany's main winter sports resort in located in Abetone, on the border with Emilia Romagna and around 50 km / 31 miles north of Pistoia. This is also one of the best ski resorts in Italy and has some great slopes and spectacular mountain scenery.